We have decades of experience in manufacturing which allows us to provide you with vibrant and fresh designs in outdoor furniture helping you to bring the comfort and beauty of the inside to your outdoor spaces. We constantly monitor color and fabric trends throughout the season providing our customers with the most fashionable fabrics and styles to add a special flair and contemporary aspect to any garden, patio, or outdoor area. Sundale works with high-quality products in tubular steel, long lasting resin, natural wood, and versatile aluminum. Our products provide the imagination with beauty and comfort that will work for you and your outdoor environment. Like a tropical breeze, the Sundale Outdoor 16 ft. Market Patio Umbrella brings a welcome touch of cool to your outdoor space. It’s supported by a heavy duty aluminum pole with a sophisticated powder-coated finish that resists rust and corrosion. 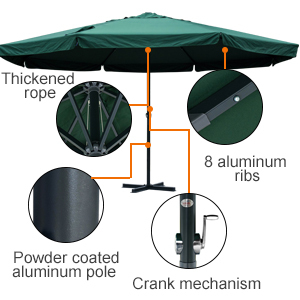 Open the umbrella easily simply by turning the crank lift and block out the sun. 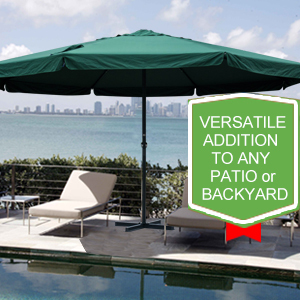 The sturdy 8 aluminum ribs construction provides plenty of stability for the 16-foot shade that won't crack or snap. 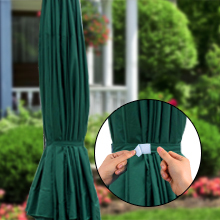 The durable, UV-resistant polyester fabric is made to last so you can enjoy the shade for years. You can choose from a wide range of vibrant colors to best suit your style and space. With click-in pole connector allows for easy installation, breakdown and storage. Enjoy warm weather without getting burned. Whether you're storing it away for the evening or the season, keeping your patio umbrella securely closed against the elements is a great way to prolong its life and appearance. We know how important home is, so we want to help you find exactly what you love for where you live. That's why we offer patio umbrella series for you to see and touch. What's NOT in the Package? The strong pole is made of aluminum with a cross base to make your umbrella stay firm. But extra umbrella base is not included. 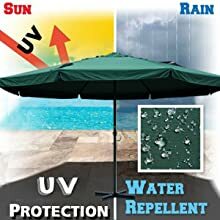 Constructed with a high-grade solution dyed polyester fabric to withstand natural elements insuring umbrella is as durable as it’s good looking. 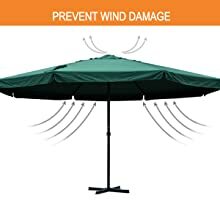 A velcro closure ensures minimal outer surface area is exposed when your patio umbrella isn’t in use, and that it will never open on its own due to strong winds. Air vent allows enough air flow, cools air under the umbrella, and withstands sudden gust ensuring the umbrella stability. Item is very sturdy and well made. I'm very pleased with it's size and quality. This was a great buy. 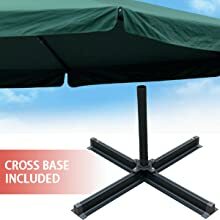 I was hoping to find a cantilever umbrella to cover my small patio and this is perfect. I love the square style compared to the traditional style. I am very pleased and get many compliments. The color is a rich chocolate brown. I did have to purchase the bag to secure. I used rocks vs sand in the bag and so far it has withstood strong wind, severe thunderstorms, takes a licking, keeps on sticking. This umbrella fits our space very well. I like the ease of opening and taking down. Only down side for me is would have preferred different color but they were out of that color at time of ordering. I have to say this is a great umbrella. It looks great and I really like the square design. I'm thinking of getting another one for the other side of my patio. The 12x12 red brick pavers fit perfectly which you do need something to keep it stable. Love this umbrella!! Looks good, provides shade and you don't need a table to hold it up. All my neighbors love it as well. You do need to get a base and it must be a strong base. But it's well worth it! Sturdy. Decent quality. Should last a few years. Very easy to set up. Nothing to it. I expect it will last several seasons. I paired this umbrella with an inexpensive base from a local patio furniture place. I love it. I live in Reno, NV and it gets windy almost everyday. A few times I forgot to take it down and it is till fine. Looks pretty too. This umbrella was purchased to be a gift and was well received and is in constant use. I also purchased a stand which holds the umbrella securely and is also in constant use.